› Smart plan voice minutes will be applicable for all local operator call cases including community numbers. › Smart plan voice minutes will not be applicable for any IVR based voice services like 121, 4000, 789 etc. › Extra usage fee of BDT 0.01/10KB applicable after exhaustion of the respective volume limits of the smartplans for uptp › BDT 200 after which the data package will get discontinued. › SMS and MMS will be applicable for GP-GP numbers only. › To check Internet Usage and remaining Voice, SMS, MMS customer need to dial *121*1*4# or send SMS typing VIEW to 5000 (no charges applicable). › If a customer purchases another Smart plan pack while using one already, then the Voice minutes, SMS, MMS balance, and pack validity duration will be added to the existing plan’s respective volumes and validity duration. › 10 sec pulse applicable in Smart plan talk time for all prepaid customers. › Offer applicable for all Grameenphone prepaid and postpaid products (except I-SIM Postpaid) until further notice. 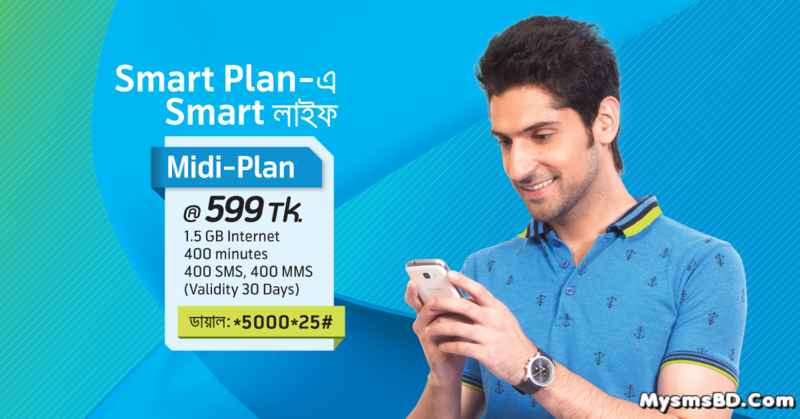 › For Smartplan data, voice, SMS and MMS will be carried forward after successful auto-renewal. If a customer fails to auto renew, he/she will be able to continue enjoying internet access at the default Pay As You Go rate (BDT 0.80/MB up to BDT 200; SD, SC and VAT applicable).